This year's Park Life is just 5 days away and is going to be jam-packed with something for everyone. It takes place just off Grove Road between the Texaco Garage and the Brittania Fish Bar. Prize rosettes for the top four in each category with each winner receiving a gift donated by Hounds of Bow. Each category winner will be entered into the Best in Show competition at the end to win a trophy. 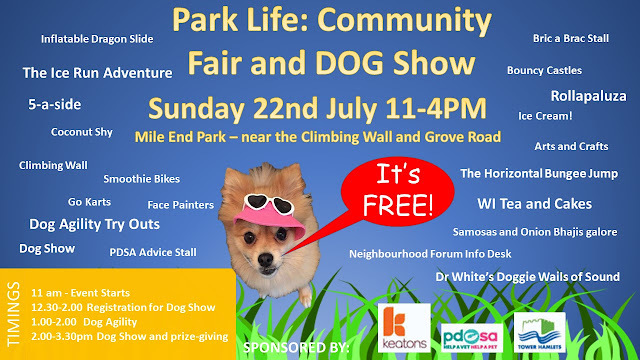 This year we will again be running Dog Agility demos and try-outs. So bring fido and see how he likes our agility course courtesy of Friendly Creatures. *Still working on this one, but it is likely to be a "treat and spoon" race with a statutory sit halfway. No eating the treat until the end!